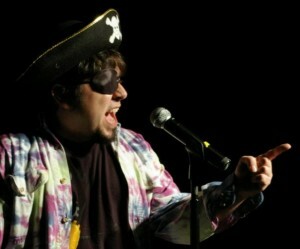 Kevin Spak on the Emerson College mic in costume (as if we had to tell you). Photo by Artie Moffa. A funny, energetic and dynamic performer, Kevin was a long-time open mic and slam standout at the Cantab since 2002, featuring throughout New England and, just for fun, hustling the occasional rookie slammer at the bar. After a brief hiatus in 2005-2006, Spak returned as a perennial slam favorite and in 2009 took top honors (along with duet partner Melissa Newman-Evans) at the Cantab’s first-ever Group Piece Slam. Spak found his way to the Cantab hosting staff after rocking the stage as a slam host for the 2010 College Union Poetry Slam Invitational at his alma mater, Emerson College. His high-energy approach to audience engagement runs somewhere between plain-spoken auctioneer and charismatic mad scientist, and no lackadaisical judge can escape his devilish one-eyebrow raise (unless it’s hidden behind the eye patch, of course). Kevin Spak featuring with guest Artie Moffa at the Cantab. He is the author of two chapbooks, Hundred Dollar Suit and Year of the Spiral Staircase, and a murder mystery poetry folio entitled Before Midnight. Kevin also holds co-design credits for several board, card and role-playing games, including Gladiators (Rio Grande, 2013), Cosmic Pizza (Cambridge Game Factory, 2012), the Game Chef-winning independent Shakespearean RPG Forsooth, and the hypothetical-battle game Clusterfight. His secret identity is co-chief designer at Spoiled Flush Games. Kevin served as one of the Press Leads for the 2011 and 2013 National Poetry Slams. In 2013, he founded and co-directed SlamCenter, the world’s first sports-style podcast featuring nightly poetry slam news highlights and analysis from the National Poetry Slam. Kevin relocated to Denver, Colorado in the summer of 2014. He may be reached through his Facebook page.